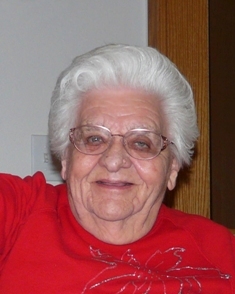 Ida Mae (Garves) Isensee, 91, of Sparta, passed away February 3, 2019 at the Morrow Memorial Home, Sparta. She was born July 18, 1927 to the late Robert and Hilda (Maack) Garves in the Burns Valley, Rural Bangor, WI. As a child, the family moved to Cataract. A few years later she met her future husband, Donald Isensee. Donald preceded her in death on January 13, 2001. Ida Mae is survived by her children, Donald (Sandy) Isensee; Dale (Sue) Isensee; Carol (Bill) Wadephul;,all of the Sparta area; and Cheryl Isensee, of Tomah; grandchildren, Jeff Isensee, Christopher (Patti) Isensee; Nichole Isensee; Joe Isensee; Jennifer (Wes) Thayer; Billy Wadephul; and Jamie (Kevin) Gregar; Cory (Lindsay) Weibel; and Amy (Chris) Welker. She is further survived by great-grandchildren: Jordan, McKenzie, Kylie, Samantha, Christopher, Nickolas, Alena, Harley Isensee, Justin, Corbin Thayer, Kendalyn, Aliza, and Jacobe Gregar; Hannah and Elliott Weibel; two great-great grandchildren, Everly Wilson and Ivy Hallingstad; and many nieces and nephews. She was preceded in death by her husband of 58 years, Donald; parents, Robert and Hilda; two infant sisters, Carrie and Lillian Garves; three sisters, Alma (Harold) Tenner; Dorothy (Maynard) Jerome; and Charlotte Baker; three brothers, Rex (Irene) Garves; Lyle (Lucille) Garves; and Kenneth (Shirley) Garves. Visitation for Ida Mae will be at the funeral home on Wednesday, from 4-6 p.m. and on Thursday from 10 a.m. until the time of services.